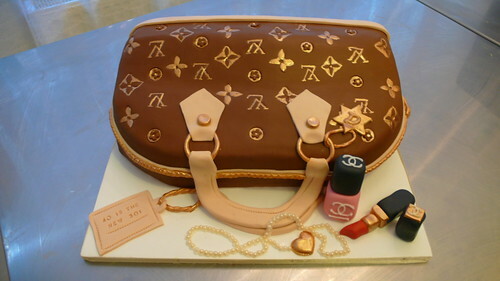 LV Bag with Chanel makeup cake, a photo by CAKE Amsterdam - Cakes by ZOBOT on Flickr. Louis Vuitton bag! This one with blinged out accents including CHANEL makeup, lipstick, nail polish and pearl necklace for Diti's 40th! Love the text too : "40 is the new 30!" Yes it is indeed!! !